AFTER FOUR WEEKS OFF WE’RE BACK WITH AN UPDATE IN NON-CONFERENCE STANDINGS. My first draft was typed in all caps but I narrowed it down to one sentence. Over the four-week break from posting, I actually did post some statistics I calculated over all-star weekend regarding the two all-star games that you can find in the My Soup section. 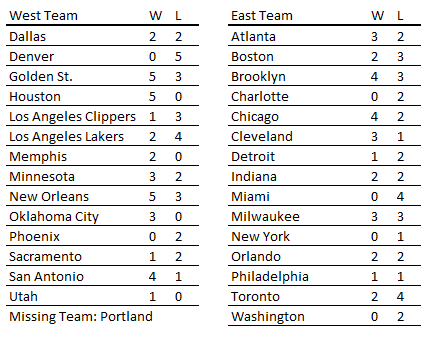 Anyway, the East fared okay against the West just before and after the all-star break but also after the trade deadline. From weeks 15 through 18, they finished 27-34 but were 21-20 coming into last week if that makes sense. Many of those losses last week were close games, including Cleveland’s overtime loss to Houston on Sunday, and finished week 18 6-14. Below is the updated week-by-week breakdown along with non-conference records from teams over the last four weeks. So among other teams, Denver stunk, Houston played well, and Brooklyn has scored some wins that might not have been expected from them. They’re still doing that with a win last night over Golden State. That’s all I have to say, though. WOW, GREAT ANALYSIS, but I don’t have much else to say as I have to post this ASAP and prepare for work way ahead of time than normal because SO MUCH SNOW. Again, while I haven’t posted much at all on this here blog this season, I added some stats to the My Soup page. Otherwise, I’m writing at Nylon Calculus. In time I’ll add some different posts. I didn’t have time to post another Dream Team over all-star break like I originally planned, so I’ll save that for the season’s end. I already have a bunch of ideas for posts to write in the off-season. As for the non-conference postings, I’ll include some more stuff next week than I did for this post. That shouldn’t be too hard since this week I just copied and pasted some statistics. Story of my writing lately, actually.